Splendid views of the ruggedness of the Hinterberg, protected moorland at Chapfensee, the sparse and arid Kleinberg, touristic Flumserberg, Mediterranean Quinten, power and peace in the hotspot of Amden. The Walsa-Weg (Walensee-Sarganserland-Trail) offers hikers the chance to get to know the many faces of Heidiland. At an average height of 1000 m, the route links the many high-level terraces of the the Flumserberg and the Amden Riviera. These afford unique views of eastern Switzerland’s mountain world, the Rhine Valley, Sarganserland and the deep-blue Walensee. Falknis, Alviergruppe, Gonzen and Churfirsten form an impressive rocky backdrop on the horizon. 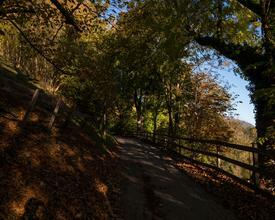 You experience the primal ruggedness of the Hinterberg on a mainly good network of trails. The beautiful, protected moorland at Chapfensee near Vermol stands in contrast to the bleak, aridity of Kleinberg. It’s a pleasure to hike through the sun-soaked fields of Flumserberg, flourishing in both an agricultural and touristic sense, then begins the descent to Walensee. After a boat trip to the opposite shore, you think you’re in Mediterranean Quinten in Ticino, before climbing to the last sunny terrace and the hotspot of Amden. For hiking, follow the logo indicated on the yellow signposts. Take a printout of our web map on your hike for safety's sake.